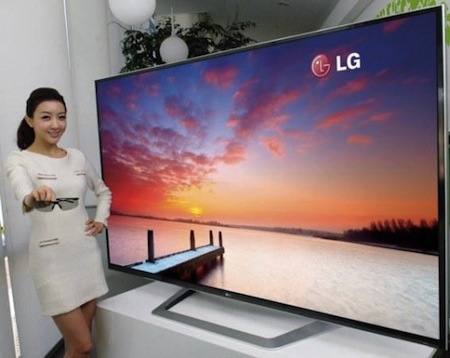 LG now offers the first TV certified as an 84-inch television ultra HD TV. Its video resolution (by the rules) must offer at minimum a resolution of 3840 x 2160, and an aspect of at least 16×9. The Consumer Electronics Association (CEA) officially dubbed the next advancement in consumer video resolution as “Ultra HD” earlier this month. This moniker, or variations thereof — like “Ultra Definition” — have been used in PR literature from various early adopting companies, but this certification from the CEA will now make it a part of the entire industry’s vernacular. Previously, the technology was referred to as 4K because it has a horizontal resolution of around 4,000 pixels. The technology offers resolutions that are nearly four times greater than current 1080p technology. And for $20,000, you can have one for your very own. Of course, you're going to want some content that has four times the resolution of regular HD. However, until that content is available, it is possible to up convert 1080p media. What would Ray Bradbury choose to show on such a device?